A Tonk's Tail... err, Tale...: "I bagged a BIRTHDAY!" Yes we say Happy third birthday Faraday too. Have a fabulous Friday and stay cool. Happy Birthday buddy. Hope you have a GREAT day with lots of prezzies! Happy birthday! Don't worry about black, it's the color of chic. Purrrrrrrrrrrrrrs. Happy Birthday Sweet Sweet Cute Boy with a doppelganger.. Happy Birthday Faraday!! I must say, you look a little surprised! what's in there? Happy Birthday Faraday. We can't wait to see what great things are in your bag. We bet you can't wait either. Hope you all have some pawty plans today with lots of good noms. Purrs and hugs, Lily Olivia, Mauricio, Misty May, Giulietta, Fiona, Astrid, Lisbeth and Calista Jo. happy birthday, little man! hope you got cool stuff--and the black bag doesn't mean anything! When Mommy turned thirty, her co-workers hired Death to come to work and sing & dance...it was hissterical! MOL!!! HAPPY HAPPY BIRTHDAY ADORABLE ONE! 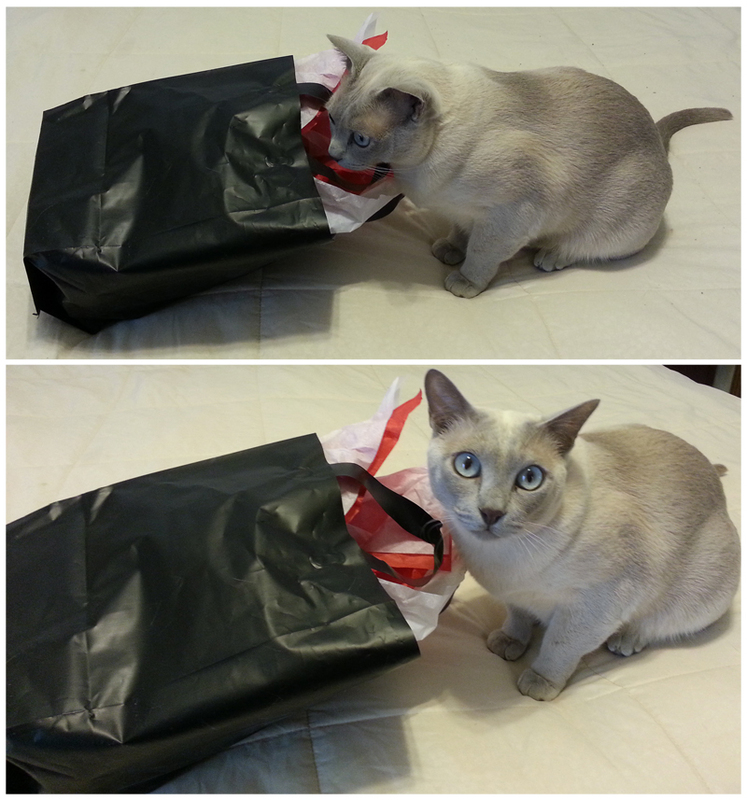 A bag is a pretty awesome present, though we're not sure about the black. LOL. Happy birthday, Faraday! Happy birthday, Faraday! I think a bag and paper is a great gift! I don't see anything wrong with basic black. Happy birthday, Faraday! A bag and tissue paper sounds like a fun gift. Do you fit inside? Many Happy Returns! So what was in the bag? Happiest of 3rd Birthdays to you!!!! I'm sure I do this every time I see a picture of you but you're just so darn handsome!!! Happy Birthday! Happy Birthday Dear Faraday! And many more...I'z got my jazz paws going for ya overtime dear buddy and hope you had an awesome day with your Birthday bag! Faraday! I didn't know you were able to celebrate turning THE BIG THREE but I hope it was fabulous - and I bet there was something equally fabulous in that black bag!!! Happy 3rd Birthday - hope you spread the celebrations to last the entire weekend? Happy Belated Birthday, Faraday! Sorry we're late but we hope you had a wonderful birthday!